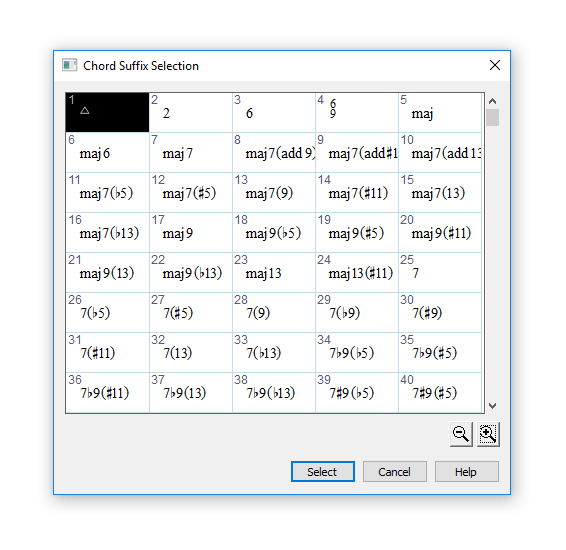 While Finale’s Chord tool was designed to intelligently guess your chord suffix when you type it in, historically this worked less well the more complicated your chords became. Trying to type in things like “Em(maj7)” often resulted in the “Could not find chord suffix…” message. In Finale v26, we greatly expanded our Chord Suffix libraries to increase the likelihood that Finale could find your suffix. Type the root of the chord, followed by a colon, then the number of the suffix you want. Don’t know the number associated with the suffix you want? Few of us do. So instead, type the number zero (0) to pick from a list of suffixes. Simply double-click the suffix you want to use. But before you do, note the number associated with the suffix. If you use this suffix often, you can save time by typing root, colon, and that number. While admittedly “root:0” isn’t 100% intuitive, it’s fast, easy, and ensures you don’t accidentally mix and match chord suffix fonts. Sometimes you may need a chord suffix that differs from those in your existing document. Rather than creating a new suffix from scratch, I suggest copying an existing suffix and editing it. This is easy to do, but can be tricky to figure out the first time. Enter a similar suffix first. Next, right-click on it and choose Edit Chord Definition. Click Select next to “Suffix,” then click the Duplicate button. Then make the necessary edits to the new duplicate. Doing this can help to set up your new suffix correctly, using the same fonts from your other chords. Under Search For, choose the old (incorrect) font, and under Replace With, choose the font you want to use. Tip #4: Find Your Reading Glasses, Or…. Sometimes when looking at charts you made years ago, you might think: I wish I had made those chord symbols a little bigger. 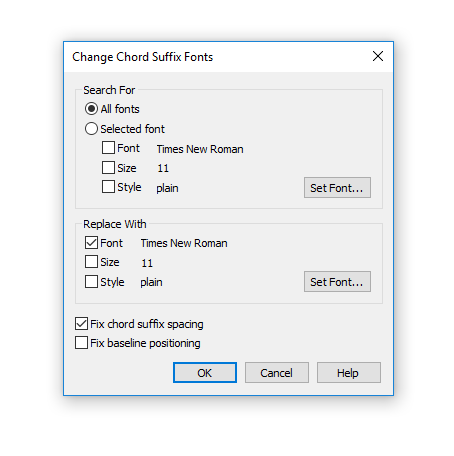 While you could certainly change font sizes using the Change Chord Suffix Fonts process described above, Finale v26 also offers another option. In v26, we added a comprehensive library of larger chord symbols that are easier to read than in previous versions. To explore this library, click File > Load Library, then load one of the “Large” libraries in the “Chord Suffixes” folder. Please let us know how chords are working for you on our Facebook page.